Start > NOODLE MASTER Labs > Why did ramen get so popular so fast? China has Lanzhou Ramen with a history of 4,000 years. Japanese ramen was originally created by Chinese who emigrated to Japan about 100 years ago. Even though Japanese ramen has a history of only 100 years, why do we see more ramen shops all over the world than Chinese noodles, or the word, ramen has become more famous than any particular type(s) of Chinese noodles? 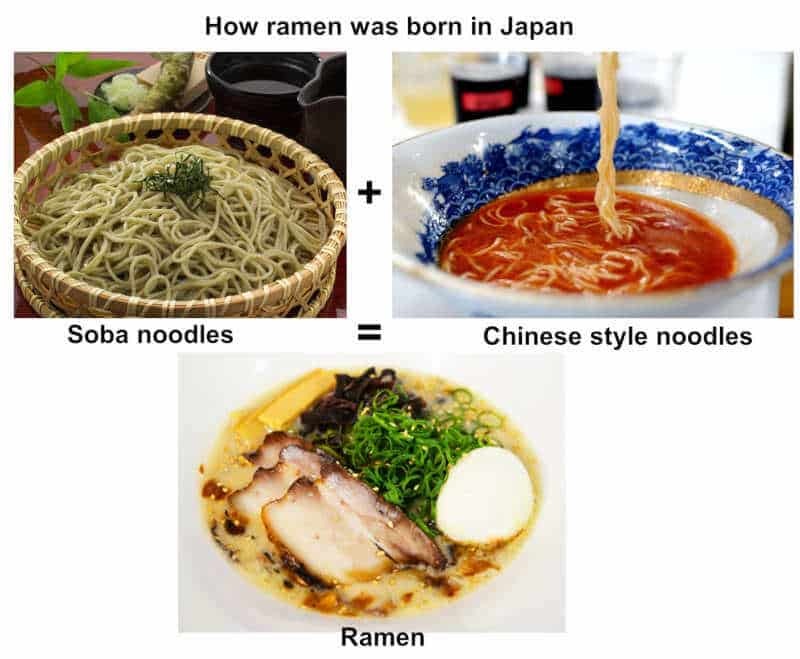 Before we get into the details of why, we should first establish what Japanese ramen noodles are and how they’ve become ramen noodles that they are today. Because of this unique foundation Japan had (the fact that unique noodle eating cultures existed) before ramen was born 100 years ago, ramen was created in Japan by incorporating those unique noodles. is a combination of Chinese ramen soup and Japanese buckwheat soup stock. In short, Chinese ramen came to Japan, and underwent a process of innovation by merging with Japanese buckwheat cuisine. 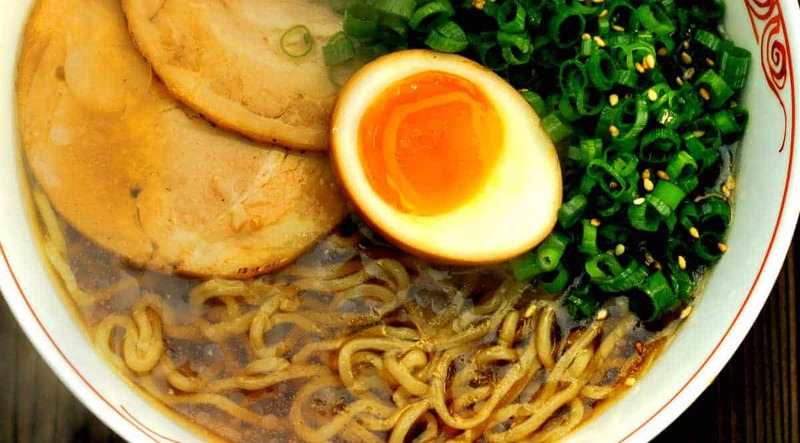 The biggest difference between Japanese ramen and Chinese ramen is in the use of compound multi-ingredient seasonings as well as aged seasonings with complex tastes called, "motodare". Kaeshi used in Japanese buckwheat noodle cuisine (made by mixing and aging together sugar, mirin and soy sauce) became the motodare or concentrated sauce that determines flavor/taste of a particular ramen soup (for example, soy sauce or shoyu, shio or salt, miso or fermented soybean paste, etc.) for ramen soup. Japanese ramen is characterized by an intense taste and flavor one enjoys from eating a combination of soup with the motodare and noodles. Therefore, Japanese ramen has become a new, innovative food completely different from Chinese ramen. And, the ramen went viral over the world. On the other hand, for sushi, which is also a part of Japanese cuisine, a sushi robot was invented, and it spread across the world. Because sushi robot or machines allowed anyone to make fairly good sushi with consistency, it contributed to the speed of growth in different countries. In case of ramen as well, ramen noodles machines were invented about 150 years ago in Japan, and these technologies as well allowed anyone to consistently make good ramen noodles. Then, they helped ramen cuisines spread all over the world. Noodle surfaces must be completely covered with soup stock so that when one bites into noodles, the noodles taste good with flavors of the soup. In order for this to happen, we need to have a highly concentrated white soup stock, which is base soup stock that may be cooked from different ingredients (animal bones, fried seafood, vegetables, and even fruits, and others). Because of high density of white soup stock, soup covers and stay on noodle surfaces so that one can taste the soup when eating noodles. Udon is traditionally served in Kakedashi soup. Udon soup is characterized by the aroma/smell of fish/seafood ingredients used to make the stock. Stock has to wear unique flavors of fish/seafood. 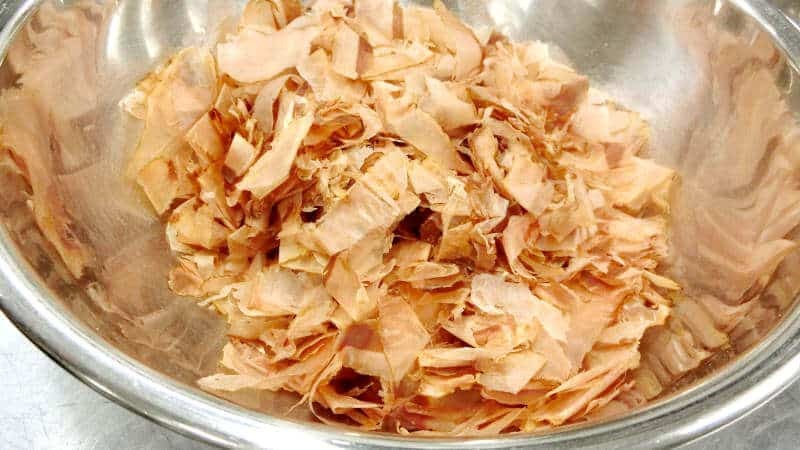 The fish ingredients used to add fish flavor/aroma are dry fish flakes, which are thinly shredded. These are cooked over short period of time (3-5 minutes) to add aroma/smell rather than the taste of the fish flakes to udon stock. In contrast to udon soup, soba soup contains a lot of fish tastes in the soup itself. So, there isn’t much of smell/aroma remaining in soba stock after cooking. To add tastes to soba stock, dry fish flakes that are thickly shredded are used. And, these flakes are boiled for a long time (20-40 minutes) in order to add fishy taste to broth without fish flavor/smell remaining in the stock. 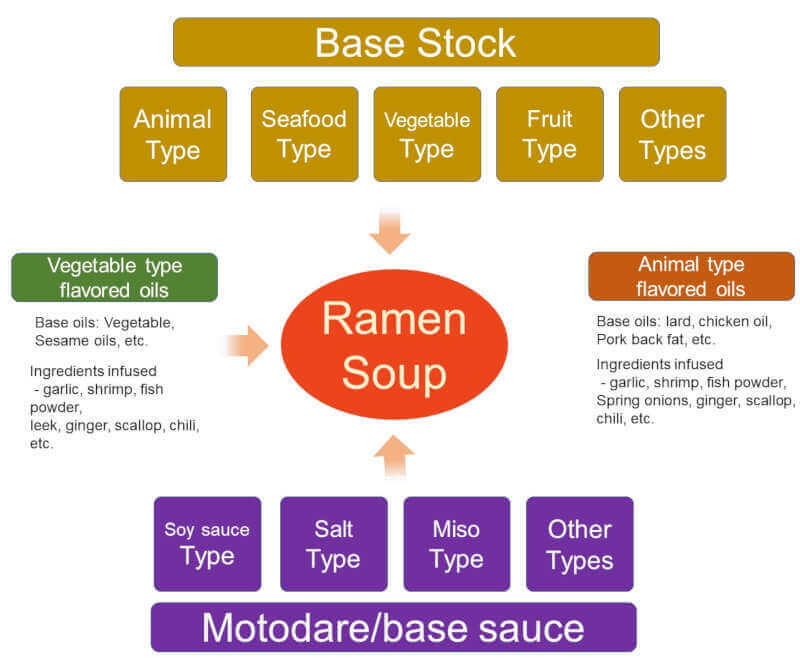 There are many types of motodare, such as shoyu-type, shio-type, miso-type, tonkotsu-type, tonkotsu-shoyu-type, tsuke-men (dipping noodles)-type, etc. 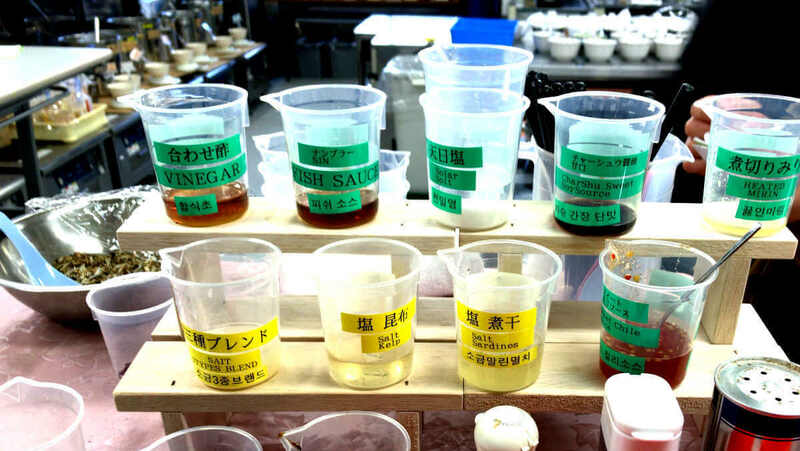 And, it is made of the following base ingredients, soy sauce, sugar, mirin (sweet sake), salt with the following ingredients typically infused into the base ingredients, seafood: dried marine products: shrimp, scallop, clam, sardine, mackerel, small sardines, etc. And, types of oils typically used are, animal oils, fish oils, vegetable oils, with the following ingredients infused into these oils; ingredients, dried fishes, shrimp, scallop, clam, sardine, mackerel, small sardines, vegetables, onion, garlic, ginger, celery, spring onion, and so on. soup blending involves a number of components, various motodare, base stock, flavored oils, etc. has been evolving over the years since its birth about 100 years ago, and it seems to continue to innovate and develop something new every year or when it is adopted to new markets with different food cultures. We are always excited to see and even develop (by ourselves) new ramen dishes or concepts of ramen, which may happen in any of the classes we teach in our ramen school every month.